There are no vacations for your adrenal glands when your life is chronically stressful. They have to work hard continuously to meet the demand for stress hormones. 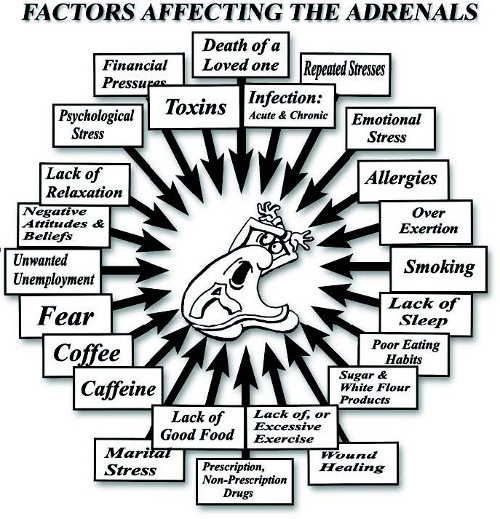 What can you do to help your adrenal glands? Replenish daily all the nutrients the adrenal glands need to make hormones – having even one missing or in short supply interrupts the complicated, multistep production of adrenal hormones. A hormone-free stress glandular can provide bioavailable protein nutrient complexes that are particularly suited to support adrenal gland structure and health. Provide daily extra vitamin C to meet the increased demand from stress. Vitamin C is so essential to the adrenal glands that blood levels were used to measure adrenal function before adrenal hormones had been identified. Increase antioxidants (vitamins A, C and E; plant-based foods like berries and nuts; spices and herbs) to help counter oxidative tissue damage that accelerates during stress. Eat regular small meals and snacks of adequate protein, good quality fats and complex carbohydrates regularly throughout the day. Avoid coffee, colas and other caffeine sources – they drive your adrenals without providing support. Avoid sugar, refined flour and junk foods – they use up nutrients they don’t replenish.